A day later, Mr. Pillsbury huddled in the Oval Office with President Trump and senior members of the White House economic team ahead of a pivotal weekend meeting in Argentina between Mr. Trump and President Xi Jinping of China. For more than an hour, Mr. Trump, Mr. Pillsbury and advisers including Steven Mnuchin, Wilbur Ross, Larry Kudlow, Jared Kushner and Peter Navarro, who joined remotely from California, strategized about negotiations with China that could determine the direction of a trade war that has gripped the world’s two largest economies, spooked global markets and shaken diplomatic relations between Beijing and Washington. Mr. Trump and Mr. Xi are expected to dine on Saturday evening at the G-20 summit meeting in Buenos Aires, where they will talk about the possibility of a trade truce. The United States has imposed tariffs on $250 billion worth of Chinese imports, and the rate of some of the levies is set to increase to 25 percent in January, from 10 percent. Mr. Trump has threatened to impose tariffs on all Chinese imports — an additional $267 billion — if a compromise cannot be reached. Mr. Trump has received conflicting advice from his trade team about how to approach China but it is Mr. Pillsbury’s counsel that the president is most likely to keep in mind. Ubiquitous on Fox News in recent months, Mr. Pillsbury’s book “The Hundred-Year Marathon: China’s Secret Strategy to Replace America as the Global Superpower” has become a lodestar for those in the West Wing pushing for a more forceful response to the threat that China’s rise poses to the United States. “We could not have shifted the entire apparatus to this confrontational mode with China if it wasn’t for the intellectual architecture of ‘A Hundred-Year Marathon,’” said Stephen K. Bannon, Mr. Trump’s former chief strategist who recruited Mr. Pillsbury as an adviser during the transition and used to hand out copies of his book around the White House. The book, which was published while Mr. Pillsbury was advising the Obama administration as a Pentagon consultant, presents an apocalyptic view of China as a clever enemy with a stealthy plan to overtake the United States as the dominant world power by 2049 — a century after the People’s Republic was founded. At the time of its release, Mr. Pillsbury’s book was widely mocked as fringe and it drew criticism as subpar scholarship. Mr. Pillsbury disputes this critique and considers it fraudulent. Tall, bald and broad-shouldered, Mr. Pillsbury has served the United States government in varying levels of prominence as a Chinese and national security expert in administrations dating to Richard Nixon’s. Fluent in Mandarin with a doctorate in political science from Columbia University, Mr. Pillsbury, 73, gained notoriety among China specialists for his ability to gain access to Chinese intelligence and military officials and his knack for finding and translating archived documents that shed light on China’s thinking. And, like some of those in the Trump administration, Mr. Pillsbury also once considered himself a “panda hugger” — someone who thought that China could become an economic and political ally whose growth should be supported. But Mr. Pillsbury began to take a darker view of China — and its ambitions — later in his career, after interviews and discussions with top military and intelligence officials in Beijing. And he has found a soul mate in Mr. Trump — whose relentless desire to upend America’s trade relationship with China and protect domestic power has produced a trade war that has no natural path to resolution. Mr. Pillsbury was brought into Mr. Trump’s orbit during the transition period in 2016, after the president-elect spoke by telephone with Taiwan’s president, breaking protocol and angering China. He has worked closely with Matthew Pottinger, the senior director of Asian affairs on the National Security Council, and the White House considered offering him a formal role, according to a former official, but there were concerns about his ability to get a security clearance. Mr. Pillsbury said that it remained a possibility and that he would like to be the ambassador to China someday. As Mr. Trump increasingly blurs economic security and national security — viewing China’s economic rise as a national security threat to America — Mr. Pillsbury’s knowledge of China has become even more in demand. Mr. Trump’s economic team is deeply divided on how to approach China, with nationalists like Mr. Navarro and Robert E. Lighthizer, Mr. Trump’s top trade negotiator, often clashing with Mr. Mnuchin, the Treasury secretary, and Mr. Kudlow, the director of the National Economic Council, who have offered more conciliatory approaches. Mr. Pillsbury, whose fairly dark view of China has found resonance, tries to explain to White House officials that China’s leadership has its own internal divisions and advises Mr. Trump on how to leverage those splits to gain an advantage, he said. When Mr. Navarro, with whom he plays tennis and who featured him in his movie “Crouching Tiger,” asked him how to rankle the Chinese earlier this year, Mr. Pillsbury begrudgingly told him that using the term “economic aggression” would grab their attention because the word “aggression” has a more sinister meaning in Mandarin. Despite warning him that the phrase would be offensive, and probably a bad idea, in June it was emblazoned in the title of a White House report on China’s intellectual property practices. In practice, Mr. Pillsbury offers more nuanced prescriptions for responding to China’s march to global dominance. Perhaps most surprisingly, Mr. Pillsbury said that, ideologically, he gravitates more toward the views of Mr. Mnuchin and Mr. Kudlow, who have focused on communication and negotiation with the Chinese and have avoided publicly antagonizing Beijing. Others in the administration, including Vice President Mike Pence and Mike Pompeo, the secretary of state, have openly clashed with the Chinese. Some have suggested that Mr. Pillsbury’s more doveish tone is part of an effort to stay in the good graces of the Chinese. He has traveled to China four times in the last 18 months and is planning to go again in December, when he will share insights about the United States with Chinese think tanks. Consulting and writing have made for a lucrative career for Mr. Pillsbury, who is working on another book and has mused about a movie of his own. 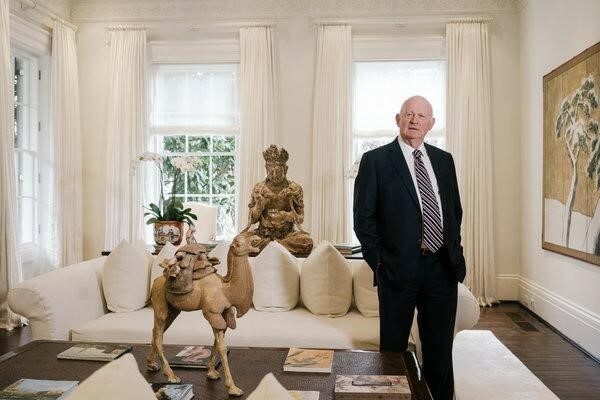 He lives in a $7.5 million Georgetown mansion with his wife, a British-born ballerina who was a member of the Royal Ballet Corps, and they own a well-curated collection of Asian art. For recreation, he flies a small Cessna, which he crashed last year during a landing in Maryland. He was unhurt.